I found out about Francine Rivers from my reading of Tony Reinke’s Lit! : A Christian Guide to Reading Books. His recommendation of Marilynne Robinson’s Gilead was disappointing. As much as it was a Pulitzer Prize winner, it comes off to me as a plotless rambling novel that goes nowhere. 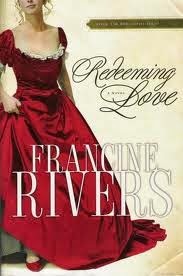 However, I was attracted to Francine Rivers’s Redeeming Love. She retells the story of prophet Hosea and his marriage to the prostitute Gomer, in his obedience to the command from God. The story is told with the California gold country, 1850, as a background. It is an amazing story – of the grace and love of God, who will receive anyone who comes to him in submission, no matter how dark their past is. I am now reading her 5-book series in Lineage of Grace - Rivers’s stories on the 5 women in the genealogy of Jesus: Tamar, Rahab, Ruth, Bathsheba and Mary, entitled Unveiled, Unashamed, Unshaken, Unspoken and Unafraid. I have not read any of this so-called historical fiction in the biblical realm before but I find Rivers being quite faithful to Scriptures, with quite an acceptable poetic license in making it into a fuller and more developed story. I like how she built the characters, making them so real and personable, giving me a fuller understanding of the narrative accounts in the bible, though I need to remember to separate fiction from fact. I was quite blown away with her story on Tamar. She has given historical and cultural details that I am not aware of. I like her story on Ruth too and I was brought to tears in many parts. However, I am not too pleased with her take Naomi’s relationship with Boaz. I am reading the one of Bathsheba now and I am also not so in agreement with her take on Bathsheba, but she has brought up many issues in both David and Bathsheba’s actions. I am indeed looking forward to reading her account on Mary. I have written a short one here myself. It will be interesting for me to read hers. Post-script on 15 March 2014: I have just finished reading Unspoken on Bathsheba and I must say it was a difficult read. Difficult because it was full of violence, vengeance and hatred. However, I also saw the weakness and humanity of David, which will give it more colour and depth when I next read the Psalms that he wrote.